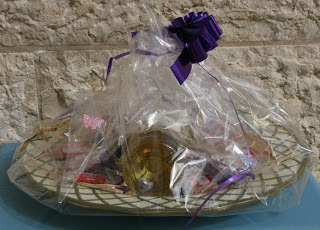 A selection of our latest Mishloach Manos. More images to follow soon. 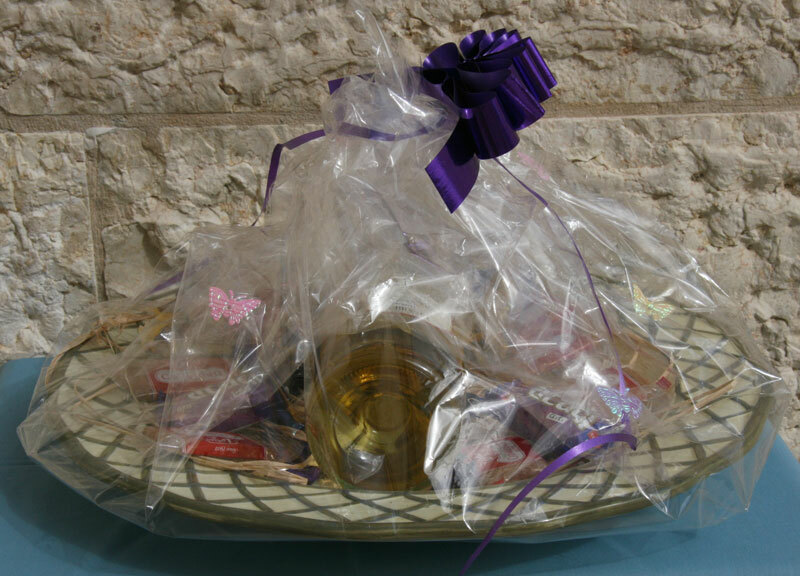 The first image is of a stunning white cake stand is packaged into a fun gift for Purim. 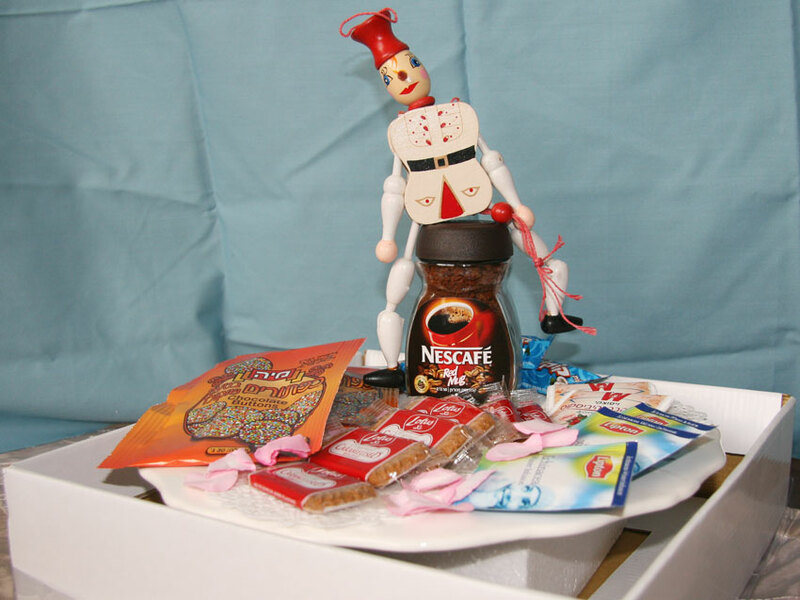 The gift contains tea biscuits, a jar of Nescafe cofee, tea bags, chocolate buttons and sprinkled with pink petals. A wooden doll adds a bit of fun. 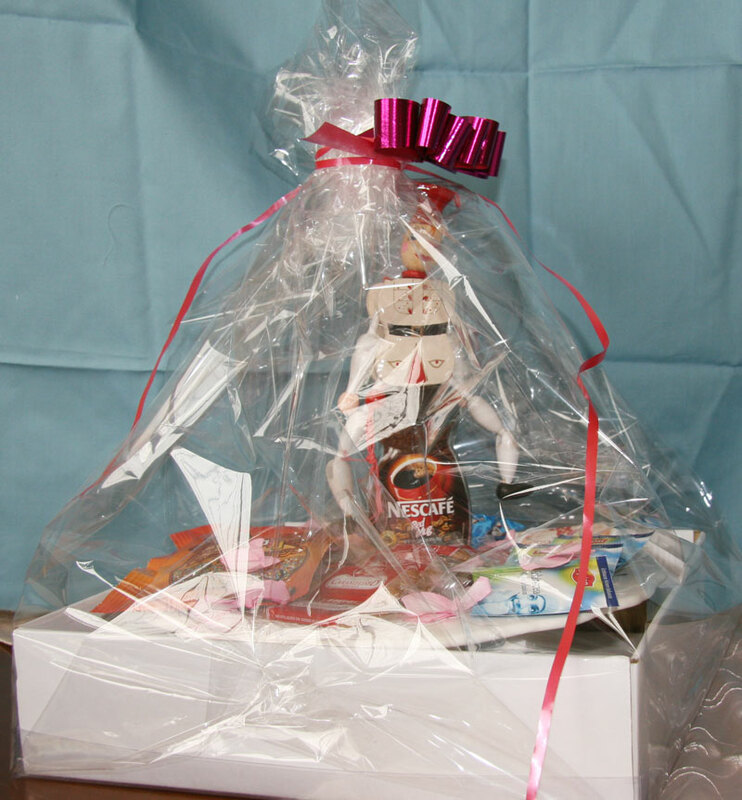 Packaged below in Celophane with ribbon. 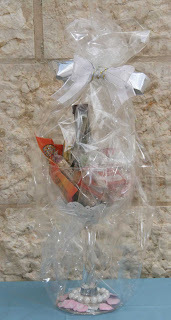 The note tag will be attached once we have wording from the one who wishes to give this stunning gift. 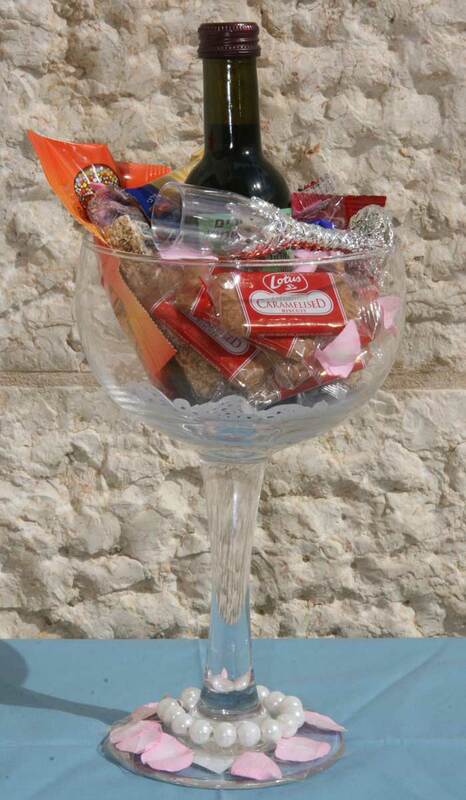 This gift is ₪ 140 plus delivery to Jerusalem and surrounding areas. 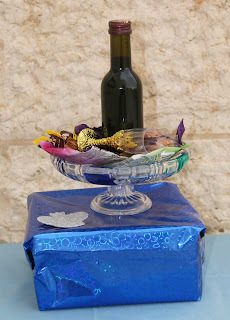 We bless you that your home is filled with the light and Kedushah of Shabbos all week long. 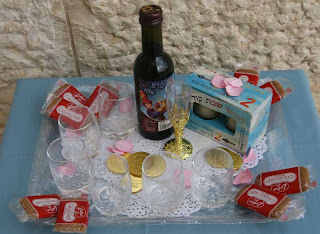 May this bring Hatzlachah and Brachah in all your Spiritual and Physical matters. This gift contains two Shabbos glasses and candles, a mini red wine and mini Kiddush glass, 6 new L'Chaim glasses, tea biscuits and sprinkled with petals. 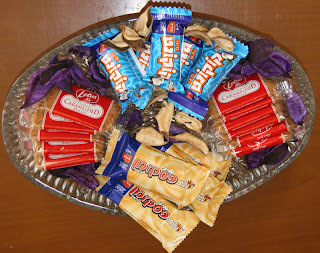 The gift is presented on a new plastic tray. Packaged with celophane and a bow. This gift is ₪ 95 plus delivery. 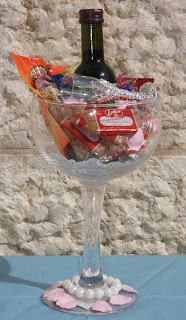 Find its partner, a little Purim fun!! The gift above is a round ceramic dish with green design and a flower in the centre. 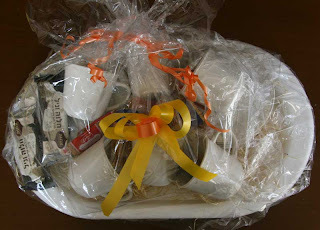 It contains a bottle of Ninveh white wine surrounded by tea biscuits and mini chocs and sprinkled with pot pouri. The gift is packaged in celophane, tied with a bow and decorated with little butterflies. 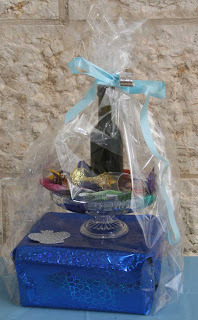 This stunning gift is packaged within a large glass bowl. The stem is decorated with pearl beads and rose petals. 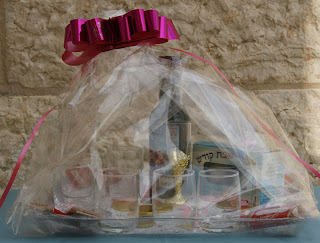 It is filled with mini bottle of wine and mini kiddush cup, tea biscuits, chololate buttons, Jelly sweets and sesame snacks. The image on the right depict this gift packed in celophane and tied with a silver bow. This gift is ₪ 135 plus delivery. Please note, the images above are copyrighted and not for use by others.